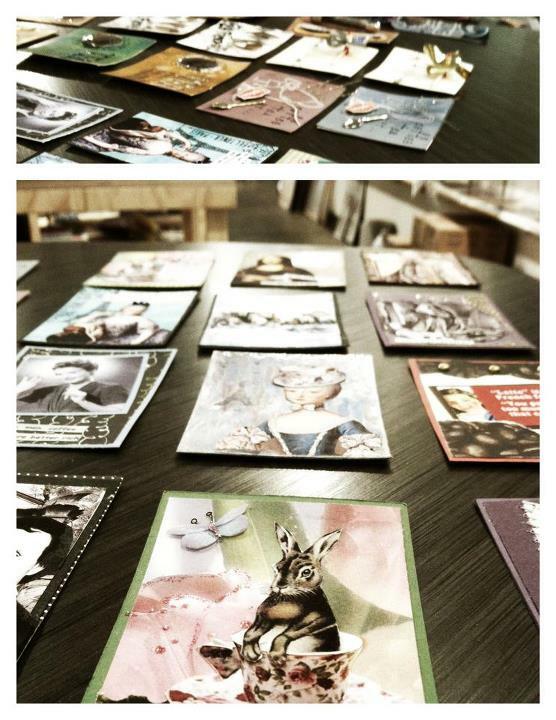 ATCs are generally made of card-stock, but could be made of wood, canvas, metal, clay, or any other durable substrate. Cards can be decorated with any media but must be 2.5" x 3.5" with the artist's name, contact info, and title or theme on the back. It is best if each card is a little (or a lot) different so no one gets two of the same card. You are welcome to make more than one of the same identical card, but please no more than two of the same design. The method of trading will be as follows: each participant will bring any number of cards from one up to 12. Participants will sign in the day of the swap with their name and number of cards, and put their cards on display on the table. The names will then go into a drawing. Each participant will pick three cards at a time when their name is called until they have picked the number of cards they brought (ex: if you bring four cards, you will pick three cards the first drawing and one card the next time your name is drawn). Want more info, or to see examples of ATCs? Great site for basic instructions and several examples of cards. History & description of ATCs. The original ATC site with archives, exhibits, examples and history of the art form.